Vancian necromancers will eclipse your power no more! Give your wordcaster the means to destroy or ward off undying terrors—or create such horrors for his own ends. 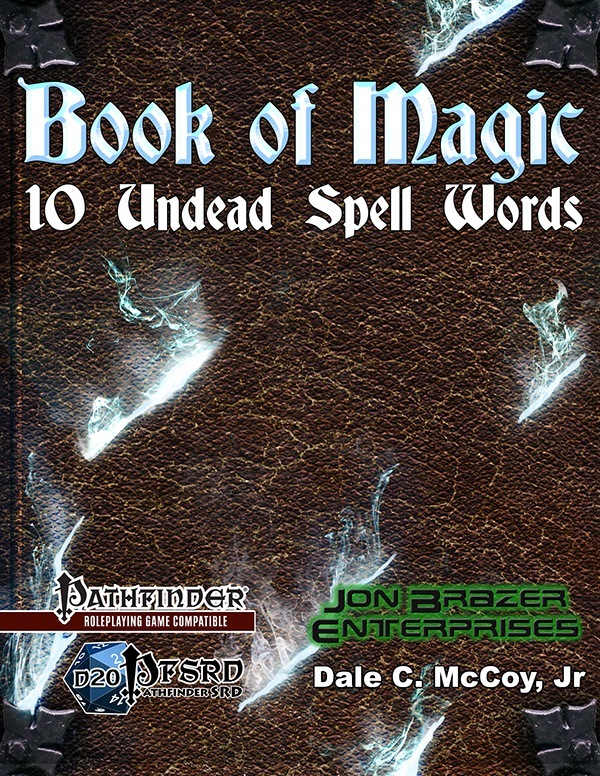 Book of Magic: 10 Undead Spell Words give you new spell words that harm undead, protect against undead, and create powerful undead creatures. This short supplement is a must-have for any wordcaster who faces off against zombie hordes and powerful liches—or who seeks to make one to do his own bidding. This is a supplement too long in the coming. While I cant say its perfect, wanting to see a few more of the words available for witch's, alchemists and even summoner and magus. If I had one complaint and it is a small one they tried to emulate what its on the base spell list a little too much. This is a must have for those that loved the idea of word magic. I really hope there will be more to come. Can any of these word spells be used by the magus? That's what I'm playing and using Words of Power, so I'm looking for additional words I might be able to use with him! Undead disruption i and ii (disrupt undead equivalent with a higher level version as well) can be used by a magus. IIRC the magus' base spell list does not include many undead targeting spells so we did not include many in here as well. Having said that, Book of Magic: Energy Words Revisited is very magus friendly. Most excellent, sir. I thank you! Is your company intending to release any other supplemental material for Words of Power soon? We're starting Jade Regent in January and am desperately trying to improve his repertoire by then! And thank you for the suggestion! I'll be checking that other one out, as well! Is your company intending to release any other supplemental material for Words of Power soon? We are not going to be doing any more words of power. Since the release of these two WoP supplements, Kobold Press ran a kickstarter for Deep Magic. One of the stretch goal for that project is to redo the Words of Power system. Wolfgang and I talked it over and we decided that 2 companies redoing WoP is not in anyone's best interests. And since KP promised a rules redo to their nearly 2000 backers, they are not going to change their mind. Since we will never be able to compete with an audience that size, we moved on. So we will not be doing any more Words of Power. Who was ready to play Spell Words with Undead Friends? I know it is ... four years late, but we have a preview for Book of Magic: 10 Undead Spell Words over at JonBrazer.com.